For a period of a little over 10 years I was a red head. 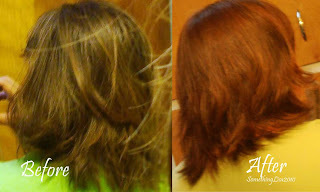 Not bright red but more of a strawberry dark blonde/light brunette. The color worked well for me, so much so that when I decided to stop dying my hair and go back to my natural "dish water blonde" (as my Mom called it) people asked me "What happened to your red hair?" I would laugh and tell them I stop dying my hair and they were always surprised. Either that or they were all good actors. I was going to write a big long explaination about my latest ideas on hair dying but decided it's boring. Suffice it to say I took the plunge again but with a different dye that is not permanant therefore it will wash out if I hate it! Not a big change but a change none the less. . . actually it looks like a bigger change than I realized in these photos. . .
My daughter says I look younger. . .hmmmm a few years younger might not hurt. I read your blog title and immediately thought you were talking about fabric! The red looks wonderful on you! Too fun! I think I would make it permanent. I should have looked at your hair more intently on Sunday. I don't remember sensing big change, so if it's still there it looks natural.